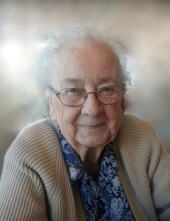 Hazel Barrow Moore of Waco passed away Saturday, November 17, 2018 in a local hospital. She was born in Haralson County, September 4, 1924,daughter of the late Marion Barrow and Elizabeth King Barrow. Mrs. Moore was a member of Waco Baptist Church, where she was the pianist for fifty-five years plus. She was retired from Sewell Manufacturing Clothing. In addition to her parents, she was preceded in death by her husband, James B. Moore; a sister, Doris Barrow King and a brother, Reedie Barrow. Survivors include a son, Barry Steve Moore of Waco and two nieces, Joan King Hamrick of Cartersville and Mrs. Marion (Pat) King of Chipley, FL. Services will be Wednesday, November 21 at 2:00 PM from the Waco Baptist Church with Reverend Ricky Shadrix, Reverend Brent Thompson and Reverend Jason Hatchett. Music will be furnished by Mike, Shelby and Amanda Smith accompanied by Joan Hamrick. The following gentlemen will serve as pallbearers, Micah Hamrick, Mark King, Danny Dickison, Mike Smith, Rodney Stamps and Stanley Vaughn. Interment will follow in Waco Cemetery. To plant a tree in memory of Hazel Barrow Moore, please visit our Tribute Store. "Email Address" would like to share the life celebration of Hazel Barrow Moore. Click on the "link" to go to share a favorite memory or leave a condolence message for the family.